"Growing up on a rural property, I always wanted to become a vet. The human animal bond is my constant inspiration. Vet's are privileged to have a window into this unique world and a scientific understanding of what makes animals so unique. Outside of work I do competitive ballroom dancing." Have known Jane many years, her kind and caring nature exudes from her. I think she would make a fantastic tv personality that alot of people could relate to and learn from. 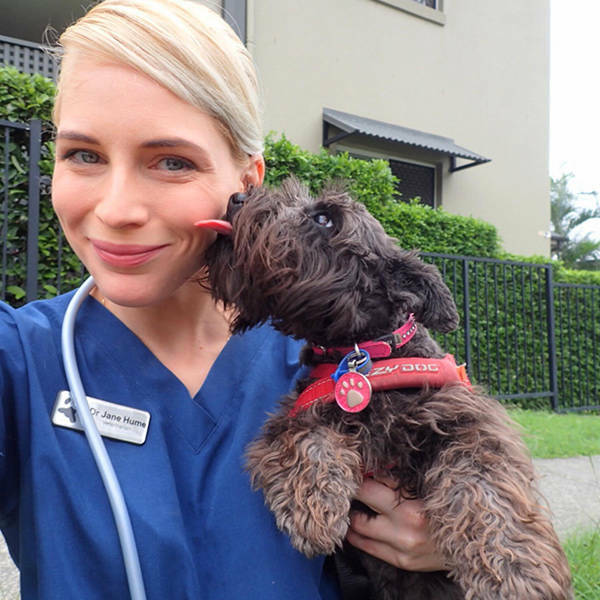 Dr Jane is a compassionate and caring vet! I feel truly blessed to have worked with her for a number of years. I highly recommend her for this position with her bubbly, friendly and professional personality...This job and Jane are a perfect match! Jane is an inspirational, dedicated and experienced vet who I would not hesitate to recommended to any and all of my friends. Personally she is a beautiful, kind and loyal person and is always there for everyone. On top of that Jane is fun energetic and bubbly! Jane is such a lovely lady. I wouldn't trust my dog with anyone else! Jane is an inspirational person and a fantastic role model for all. I know Jane through competitive ballroom dancing where I am privileged to witness her elegance and passion for something we both love. Jane is dedicated and hard working and therefore amazing at whatever she sets her mind to. Jane is such an Amazing kind caring person. I can't think of anyone better to show how Aussie vets do this. I have worked with Jane many times and I can say with confidence that she is an amazing vet ! She has such an extensive knowledge for both small animal and exotic pets. She brings to work an amazing energy and positivity attitude that helps to face challenges head on. Jane is such a fun vet to work with. She knows so much about both common and exotic species. She never shys away from a challenge and gives all of her patients the best level of care possible. From the first day I met Jane, she had always wanted to be a vet. She is passionate about her job, and loves treating all animals from dogs to reptiles! She's also a killer dancer and a fantastic person. You'd be crazy not to pick her!